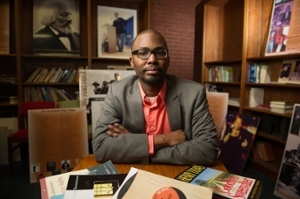 Rambsy has studied Douglass and other African American authors, and has sought ways to create humanities and educational opportunities beyond the conventional classroom. Twenty-five teachers will be selected from across the country to participate in the Summer Institute. They will cover Douglass’ Narrative with Brooks, Cali, Rambsy, as well as Jessica Despain, PhD, and Kristine Hildebrandt, PhD, both associate professors in the Department of English. Other scholars invited include Joycelyn Moody, PhD, of the University of Texas at San Antonio, Barbara McCaskill, PhD, of the University of Georgia, and Courtney Thorsson, PhD, of the University of Oregon. Photo: Howard Rambsy II, PhD, professor in SIUE’s Department of English Language and Literature, is the director of the Frederick Douglass and Literary Crossroads Institute to be offered in July 2019 and made possible by a $106,002 National Endowment for the Humanities (NEH) award.